Akinwunmi Ambode, the outgoing governor of Lagos State, who was denied a chance to serve an automatic second term by his party, the All Progressives Congress, and is due to vacate his position by May 29, on Tuesday presented a budget of N852 billion to the Lagos State House of Assembly, after two weeks of controversy that boiled to talks about him being impeached by the lawmakers. Lagos is the commercial and financial capital of Africa’s largest country by population and gross domestic product (GDP), Nigeria. It is the most cosmopolitan state in the country drawing populations from different parts of the country and across the world. The budget had been ready since late last year and would have been presented before the close of 2018 but serious political tension within the ruling All Progressives Party (APC) in the state that saw the governor denied a chance to return for a second term, put spanners in the work. In recent weeks the state’s lawmakers had been up in arms against the governor and had threatened to begin impeachment proceedings following what they alleged to be the governor decision to begin spending from the 2019 budget even when it had not been presented and passed by them. 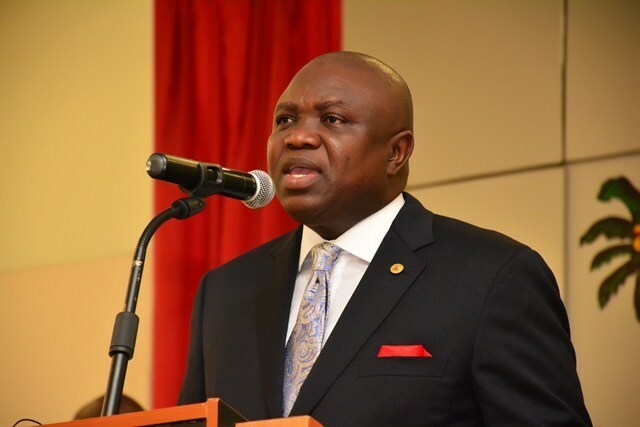 The lawmakers had officially written to Governor Ambode, demanding an explanation. Last week, supporters of the governor had thronged the state house of assembly protesting the move to impeach the governor. The made the case that the constitution allowed the governor to spend within the parameters of the budget for the preceding year up to six months into a new budget circle. On Monday February 4, 2019, APC national leader and former governor of the state, Bola Ahmed Tinubu, who is believed to still the pull the strings in the state, met with the parties in the feud as well as other party chieftains in the state, following which he assured that the governor would not be impeached. Ambode’s presentation of the budget on Tuesday is believed to have been the outcome of the Monday meeting. The budget which is 18.8 percent lower than the N1.046 trillion presented last year has a deficit amounting to N77 billion. Recurrent expenditure for the budget is pegged at N389.56 billion while capital expenditure of the year stands at N462.47 billion. According to the governor, the total budget size of N852 billion is meant to consolidate on the economic achievements of the administration in the past three and half years.